Helen prevents Clarrie from jumping into the pond by agreeing to go out with him! She wants him to go home with her and he promises that he won't cause her any more trouble as he walks off with her. Matt and Gemma are surprised to see Mel still up when they enter the house – they thought they'd get some alone time! Gemma knocks back Matt's plan's for a date tomorrow night because its a school night and the trio begin discussing Mel's forthcoming wedding. 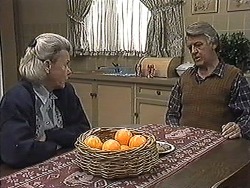 Annabelle and Ryan chat about their night out as Clarrie (and Helen) arrive home. 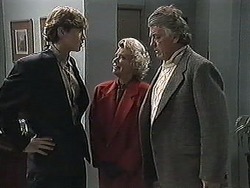 Ryan isn't too amused to see the state his grandfather is in and Annabelle decides its time she left as Helen asks Ryan to help her get Clarrie into bed. Mel is telling Madge and Gemma about a famous guest that is staying at the hotel (Darryl Cotton) and Madge is all star struck! 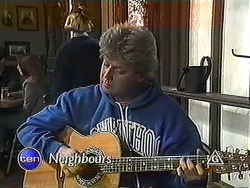 “Madge you're a groupie,” Gemma tells her as Mel explains why he's staying at the hotel. “I'd kill to meet him,” Madge tells her. 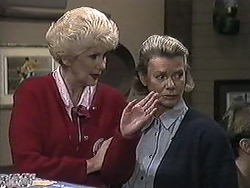 Clarrie hands over some of Dorothy's emergency money to Ryan so he can buy something to eat because he didn't go shopping yesterday. 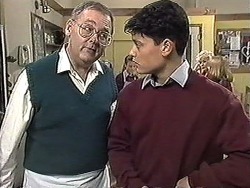 He apologises for embarrassing his grandson in front of his lady friend and Ryan suggests he apologises to Helen too after his behaviour. 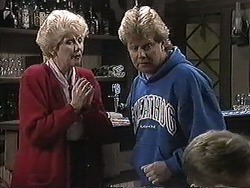 Madge is ecstatic that Darryl is in her pub! Helen has other matters on her mind though – Clarrie. Josh is determined to get the most of his free lunch by ordering a double dessert from Harold! He likes the song too that Matt has written for him. he wastes no time in showing it to Melissa, who is delirious at what “he's” written. Tania gets Mel to babysit her brother because she has other plans. She also subtly drops in that she will be doing a lot of babysitting when she marries her dad! Darryl is back in the pub looking for his lost pen. Madge tells him she didn't see it when she tidied up but volunteers to have another look for it. 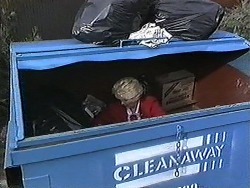 Madge is literally in the trash, looking through the rubbish trying to find Darryl's pen. Melissa is surprised that Josh has managed to put away the very large dessert, Harold likewise! Madge comes in to tell Harold about her mission and she's off again when he says the Waterhole bin has been relocated elsewhere! Mel tells Matt not to cook her dinner as she is babysitting. He points out that she seems to be spending more time with the kids than her fiancé! 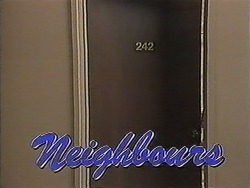 Their chat is interrupted when Madge comes in looking for Darryl's room number – she's found his pen! Annabelle reassures Ryan that she will love anything that he gives her when they talk about her party but she has to rush off to a piano lesson. 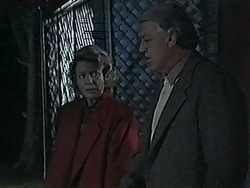 Clarrie apologises to her on the way out but she rather brushes him off. Ryan asks his grandfather for advice on what to get Annabelle for her birthday and stares at the emergency money jar while Clarrie goes to answer the door. He lets Helen in and he apologises for not calling round first thing to talk to her. She brings up his drinking and he admits it gets worse when he reaches a bad patch, so she offers to be the one to listen to him when things get bad. Josh is now paying for stuffing his face earlier! Melissa then announces that she's entered his poem into a school competition. He's not happy at her doing that though. 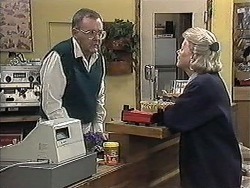 Mel calls into the store and Harold asks if she's seen Madge as she is late for her lift home. She tells him about Madge going to see Darryl and that he trusts her doing so too! Mel tries to paint another picture of what groupies get up to and you can see Harold begin to get concerned! 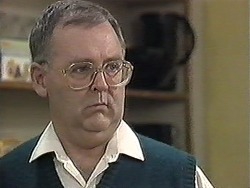 Madge finally gets hold of Darryl to returns his pen to him. In return for her finding the pen, he promises to return the favour anytime; all she needs to do is ask. “Just ask?” she double checks and he confirms it before letting her into his room to hear what the favour is that she is after!